Until his mid-40s Shorty Clark was just another typical Kiwi half-hearted sportsman. 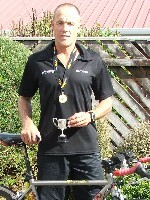 By the age of 51 he was a New Zealand age-group triathlon champion. "I was just another weekend warrior at this sport, which I had been doing for 10 years," says Shorty. "But I wanted to be world-class. That meant putting myself into the hands of Jon Ackland at his Performance Lab. I soon had a superb physical development programme in place, which I applied myself to with tremendous diligence. "But the results weren't coming; I trained harder and harder — nothing. Then Jon suggested I work with Jamie Ford at the Foresight Institute and focus on my attitude. That meant doing the SASQ attitude test, which showed a few flaws in the 'top six inches'. We put an attitude development programme in place and the rest is history." Since starting mental toughness coaching with the Foresight Institute, Shorty has won a clutch of trophies and prizes. He represented New Zealand at the World Triathlon Championships and has twice taken first place in the National Triathlon Contact Energy Race Series for the men's 55-59 age group. In the same age group, he's also been placed second in the National Sprint Championships and the National Olympic Distance Championships. That's quite a clutch of achievements for somebody who became a triathlete because of a bet with his former boss over a jug of beer. Shorty's mental toughness coaching with Jamie and Foresight took place over a few months. "Jamie taught me how to tap in to the positives, to mentally toughen up, how to turn negatives into positives and not beat myself up. In general life, it helped me to be a better person, family man and worker. "Now I can achieve the results I want. I'm much more balanced in the way I train and motivate myself." And Shorty has continued achieving sporting success — all because he developed the right attitude. American swimmer Matt Biondi, was one of the stars of the Seoul Olympics in 1988. Before the Games, it was predicted he would win seven gold medals and emulate his predecessor Mark Spitz. But in the first two events he could manage only silver and bronze. The media wrote him off believing no one could come back after such public failure. But Biondi had previously taken the SASQ attitude test, which showed clearly that he was truly mentally tough and resilient. One person who didn't write him off was Professor Martin Seligman. He had studied Biondi and knew he had the mental toughness essential to putting failure in the past while continuing to strive for success. And he was right. Biondi went on the win his next five events and at the next Olympics collected the missing two golds. He is one of only three Americans to win 11 Olympic medals.